This is the big one. Liquid crystal displays make up the vast majority of HDTVs, desktop and laptop monitors, and tablet or cell phone displays. This basic technology has been around for a long time, and has greatly improved over the years. Many different types of LCDs are in use today, but only three major classes of LCD--twisted nematic, In-Plane Switching, and patterned vertical alignment--are worth knowing about. We’ll start by discussing the simplest and most common form of LCD panel, twisted nematic. TN display panels are inexpensive and easy to mass-produce. They’re also quite fast, with response times as low as 2 milliseconds. That’s nowhere near as fast as OLED or plasma displays, but it’s by far the fastest of the LCD types. A fast response time reduces blur on rapidly moving objects and enables high refresh rates, which is often necessary for 3D displays. Unfortunately, TN panels also produce the lowest overall image quality. They have a narrow color gamut (that is, they don’t display as much of the total color spectrum as other technologies do). Typically each subpixel element can display 6 bits of brightness, meaning you can combine only 64 shades of red, green, and blue to produce colors. Most TN panels get around that limitation through a process known as “dithering,” in which adjacent pixels display slightly different colors. If the display is unable to reproduce a certain shade of blue, for instance, one pixel shows a slightly darker shade of blue, while an adjacent pixel shows a slightly lighter shade. The idea is that your eye then averages the two and “sees” the shade of blue that the display can’t re-create. Some displays switch a single subpixel very quickly between two different voltages, rapidly toggling back and forth between a lighter and darker shade, to simulate an in-between color. TN panels have poor viewing angles. From the sides, colors may shift. If you look at the display from below, typically the panel darkens, and if you look from above, it washes out. You can see this effect on almost any laptop, as most notebooks use TN panels: Tilt the lid back and forth, and watch how the brightness and contrast shift. TN panels “twist” polarized light so it is either blocked by or shines through another polarizer. How it works: Let’s start with the light source. This can be a mirror in the case of reflective LCDs, or a light such as a CCFL (cold cathode flourescent lamp) or LED (light-emitting diode). The light first passes through a polarizing filter, which aligns the light waves in one direction. Then it passes through the TN liquid crystal. The molecules of this crystal are special in that they “twist” the light 90 degrees as it passes through. Next the light passes through a color filter, which tints the light red, green, or blue. Finally the light reaches a second polarizing filter, oriented 90 degrees to the first one. If it weren’t for the TN crystal, this second filter would block all light; but since the TN crystal twists the light so that it is aligned to the polarizer, it all passes through. 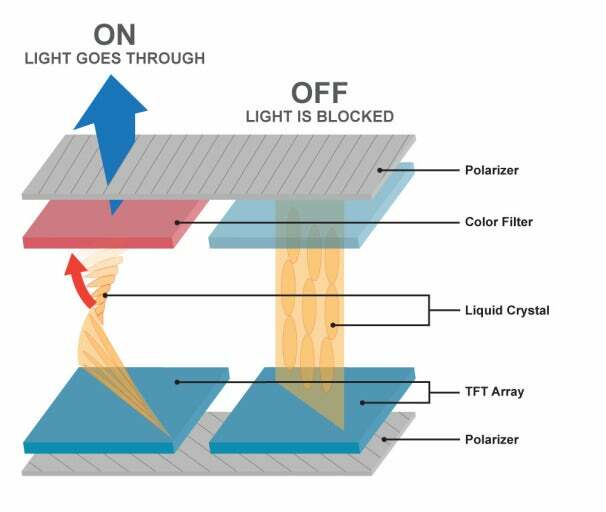 When a current is applied to the liquid crystal, it “untwists,” changing the light’s orientation and causing more of it to be blocked by the second polarizing filter. The more current that is applied, the more the liquid crystal untwists and the more light is blocked. Each pixel of a TN panel consists of three rectangular subpixels: one red, one green, and one blue. By varying the current to each of the crystals in these subpixels, you can mix the three colors to produce many different hues.